Sugar is sugar...or is it? Here's a look at a few different types of sugar from around the world. Perhaps you'll find a new staple for your pantry! Name Game: Muscovado originates from the Spanish mascabado and Portuguese mascovado, both which mean “low quality”. In the 18th and 19th centuries, muscovado was considered a lower quality of sugar because it is less refined and not drained of its molasses content. Flavor: Slightly bittersweet, with notes of pear and apple, dark muscovado is rich and complex. Think of it as the pinnacle of brown sugar. Use it in: Gingerbread, fruitcakes, coffee - dark muscovado is going to take your fall and winter baking to new heights. Texture: Lighter and softer in texture than the dark, light muscovado still packs a flavorful punch. It has the same, if not more more, molasses than standard North American dark brown sugar. Use it in: Desserts with banana, toffee, and butterscotch. What is it? Sugar produced from the sap of coconut palm flower buds. Name Game: Coconut sugar and palm sugar are often, and erroneously, used interchangeably. Coconut sugar comes from coconut palms, palm sugar comes from a variety of other palms, including Palmyra, date and salgo. Flavor: Mildly sweet with a hint of caramel. Use it in: Popular in Paleo recipes (some claim that it has a higher mineral content and lower glycemic index than cane sugar), coconut sugar can be used in place of regular brown sugar, adding a nuanced, caramelly flavor. Chocolate chip cookies are a great place to start. What is it? An artisanal sugar used in Japanese confectionary. It is used to make Higashi, a popular candy that is molded into seasonal shapes, like the flowers and crystals in the photo above. Name Game: Wa indicates domestic Japanese manufacturing; sanbon “three bowls”, refers to the production process in which cane sugar is boiled, kneaded, and drained in bowls. Texture: Very fine and powdery. Flavor: Sweet, with mild honey notes. Use it in: Coffee, tea and cakes. It can also be used in place of powdered sugar. Texture: Soft and fine with a high moisture content. Flavor: Very sweet with notes of vanilla and toffee. 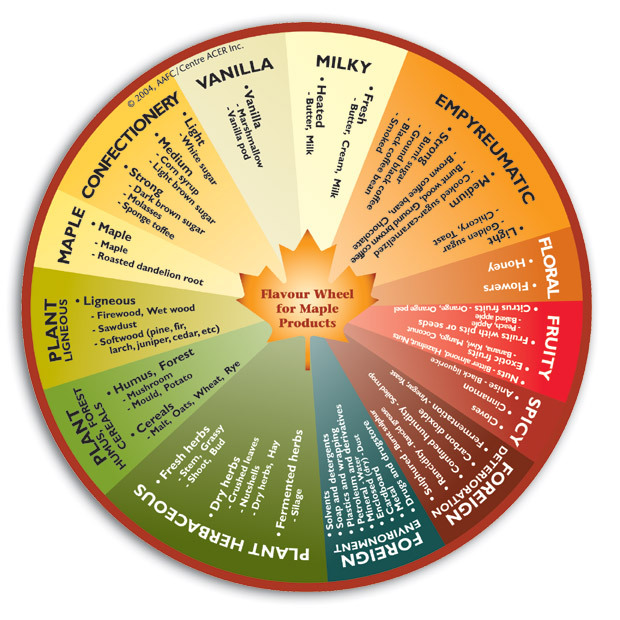 Agriculture Canada created a flavor wheel for maple sugar/syrup tasting - not unlike the ones popular in wine tasting. (Click on maple sugar photo). Use it in: Use it in place of brown sugar, but at a ratio of ¾ to 1, to accommodate for the addition moisture in maple sugar. What is it? Pure, raw, and unprocessed sugar cane. It is made by boiling and evaporating sugarcane juice - this is a molasses-free sugar. Name: Traditionally poured into a conical mold, the name piloncillo means “little pylon”. Texture: When in its traditional cone shape, the sugar is packed solid and must be cut or grated. When grated, it has crunchy, non-uniform texture. Flavor: Earthy, smoky, with notes of fig. Use it in: On the sweet side, piloncillo gives cookies, cobblers and caramels an extra earthy kick. Try it your coffee to shake up the morning time routine. According to Serious Eats, it’s also great used on meats, beans and dried chiles. Davidson, Alan. The Oxford Companion to Food (Oxford Companions) Hardcover – Ed. Tom Jaine. Oxford University Press, 2014. Print. Falkowitz, Max. "Spice Hunting: Piloncillo." Serious Eats: The Destination for Delicious. Serious Eats, 21 July 2011. Web. 1 Sept. 2016. Goldstein, Darra, ed. The Oxford Companion to Sugar and Sweets. Oxford: Oxford UP, 2015. Print. "Maple Syrup." Https://en.wikipedia.org/wiki/Maple_syrup. Wikepedia, n.d. Web. 1 Sept. 2016. Robuchon, Joël. Larousse Gastronomique. London: Bounty, 2011. Print.